A responsive and innovative eCommerce site designed and built to engage with and help parents and parents-to-be navigate the baby space. Breathable, non-toxic infant and toddler bedding. Based in Southern California, Nook Sleep Systems is an industry-leading company with products ranging from infants to adults. Nook primarily offers premier crib mattresses that are ethically-sourced, sustainable, non-toxic and organic wherever and whenever possible. Although an innovator in the baby space, their website was stuck in the dark ages. Our mission was not only to design and develop a fresh, new website but also to elevate their brand to complement their voice and product line better while also providing an easy-to-use content management system. When first approached by Nook for this project, I immediately knew who to call: Zaengle Corp. Having worked with owner, Philip, on a previous project, I knew he was the perfect man for the job. With over 100 sites under their belt, Zaengle Corp., brings a level of unmatched expertise and innovation to every project. Nook's old site was both literally and figuratively stuck in the dark ages. Users weren't able to easily navigate the site due to its sensitive hover states and non-intuitive navigation. The site was neither mobile-friendly nor responsive. The design was black and grey with the only pops of color coming from the products themselves. When Nook approached us, their message was clear: bring them into the light. How will this be used in my home or my friends’ homes? Is it organic, eco-friendly and sustainable? Does it speak to more than just baby? Is this product a cut above what's already in the market? Is this a product that can be used year after year? Are we sticking to our roots by offering quality over quantity? Is it easy to care for and make life easier for mom & dad? What is this product’s story? Does it meet our safety standards? We made sure to give that same thought and consideration to the future site, brand and overall experience Nook wanted its customers to have when interacting on the new site. One of the challenges we faced was rebranding Nook as a lifestyle brand rather than just a company offering baby products. Nook wanted to expand its focus while also conveying that the same level of consideration that goes into its baby products is also carried throughout its entire product line. 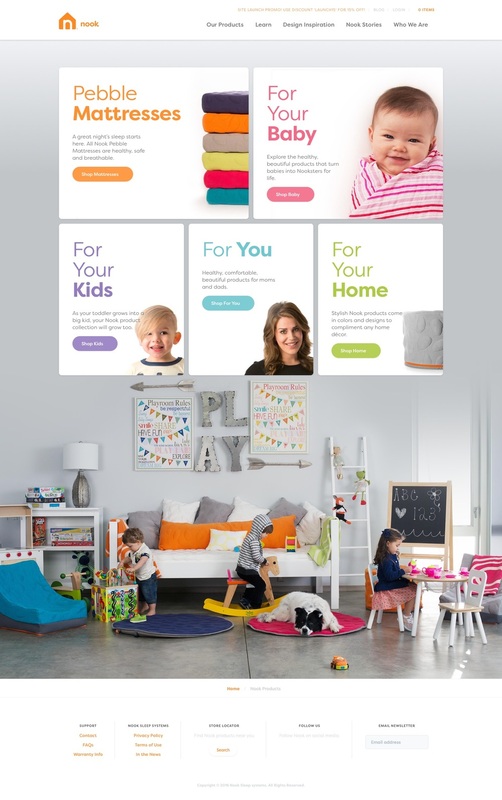 Working closely with the Nook team, we were able to establish a new navigation structure, brand and content strategy that clearly conveyed Nook was no longer just a crib mattress company. The existing brand wasn't really a brand at all. They had an established logo, but it needed a newer, modern feel. The photography was okay, but lacked the lifestyle, warmth and relatability Nook wanted to communicate. The content was dated, scientific and at the end of the day, there was just so much of it. The new site needed a defined content strategy with a core focus of being helpful. 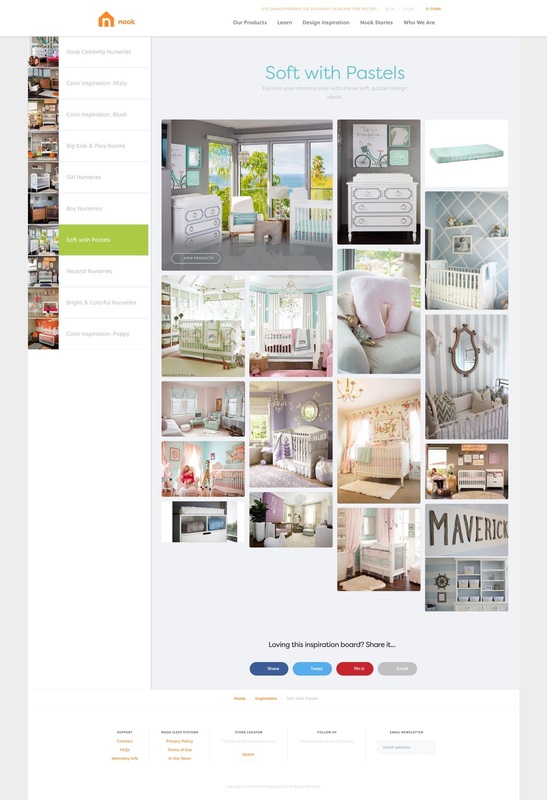 Armed with a new sitemap, brand and content strategy, we put together some moodboards, which demonstrated for the Nook team a few different design directions. The moodboards were quickly able to show both Nook and the project team exactly what Nook did and did not want. Not only did we come out of the moodboard process with everyone aligned on the voice, look and feel of the site design, but we were also all that much more excited to get started on the design. New to website design and development, Nook greatly benefited from a more hands-on wireframing process, so hi-fidelity wireframes were the way to go. The wireframes allowed Nook and the copywriter to provide invaluable feedback that helped shape the site into a more modular design that later proved to kickstart some major development decisions that were in support of Nook's business goal of an easy-to-use content management system. The design of the site was where the fun really began. Seeing the wireframes come to life and incorporating the brand new photography and content was a thrill for Nook and us. As a best practice, we created a styleguide that was primarily focused on mobile-first. The majority of Nook's customer base is on-the-go moms and moms-to-be, so developing our site with ease of use on mobile phones and tablets was a priority. The existing Nook site was built on Magento, so ease of content and product management as well as simple order fulfillment were crucial for the Nook team. To meet those needs, Zaengle Corp selected Craft CMS and Craft Commerce to provide the best set of management tools for the Nook staff while also creating a top-notch, fast and engaging experience for consumers. While the site just launched one week ago, Nook has already seen an increase in site sales and the overwhelming positive response they've received from customers and retailers has been unprecedented. We'll let them speak for themselves, though.